It's no big secret that in Mario Kart, you can start each race with a turbo boost by punching the accelerator at the perfect moment before the race begins. The question is: How do you get the timing right? 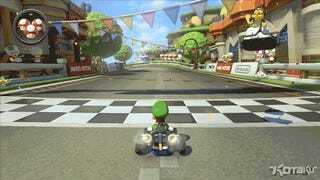 The starting boost in each Kart game works a little bit differently. In Mario Kart 8, the easiest way to master the starting boost is to watch the numbers on the screen as they countdown, specifically the 2. One way to help yourself get the timing right is to listen to the beeps as the numbers count off. If you hit accelerate right as the beep for the 2 sounds, you should get the maximum boost. Watch and listen to the 2 carefully and with a little bit of practice, you'll be flying out of the gate every time, leaving your friends spinning in your wake.